Arizona has enacted the Uniform Enforcement of Foreign Judgments Act. This act establishes the procedure necessary to get a foreign judgment recognized in Arizona. If you have a judgment from another state, you can collect on it in Phoenix Arizona. In order to do this, you must file an authenticated copy of the judgment from the other state with the clerk of a superior court in Arizona. The copy must be an authenticated copy, not just a certified copy. The filed foreign judgment will then be treated as if it were a judgment of the superior court. In Arizona a filing fee is required for filing the foreign judgment with the court. You must also file an affidavit with your name and address and the name and address of the person from whom you are trying to collect the judgment. Once you file the judgment and affidavit with the court, you must mail a notice of the filing of the judgment and a copy of the judgment to the person you are trying to collect on and then file a notice of mailing with the clerk of the court. You cannot begin to execute on or enforce the judgment until twenty days after the notice of filing is mailed and the proof of mailing is filed with the court. This article is for informational purposes only and does not constitute legal advice. An experienced Arizona collections attorney can assist you in collecting on a judgment from another state. A collections lawyer can help you through the process of filing the foreign judgment and then seeking the appropriate remedy to collect on it. 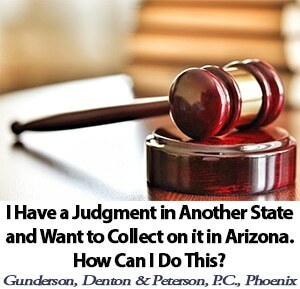 Arizona Attorney » Legal Blog » Collections » I Have a Judgment in Another State and Want to Collect on it in Arizona. How Can I do This?